Named after the beneficiary of the palace, the Quinta de Bolivar is a government building that was gifted to Simon Bolivar as a token of appreciation for his services in the freedom for independence. After Bolivar’s passing, the Columbian government acquired the Quinta in 1922 and turned it into a museum. The museum is home to many period artifacts among which are a few of Bolívar’s personal items like his sword. Love this? Explore the entire list of places to visit in Bogota before you plan your trip. Fancy a good night's sleep after a tiring day? Check out where to stay in Bogota and book an accommodation of your choice. How popular is Quinta De Bolivar? People normally club together Gold Museum Or Museo Del Oro and Colombian National Museum while planning their visit to Quinta De Bolivar. Calm and quiet place with many beautiful natural gardens. You get to learn a lot about how Simon Bolivar lived. 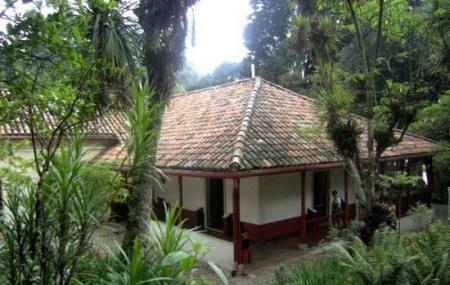 A hidden jewel in Bogota. Go, it a beautiful property on your walk back down from Monserrate. The garden and house was beautiful. It was a nice maybe hour to spend. Surprised to see that El Libertador had quite a European taste for the era, not to mention great choice of place for the house, nice garden and perfect dining room with French China. Being from Europe, we have learnt something new on the history of Grand Colombia. A great place to visit and to get to know more about Simón Bolivar and about this historic place itself, the guide is very helpful and know a lot about the Quinta's history. The garden is gorgeous. "What kind of idiot goes to Colombia?” was a common question I heard from friends when I told them I was planning a trip to Colombia. My pre-meditated response was always the same, “Mel Gibson, for one.” I would then continue naming a few more, “Madonna, Marc Anthony, Justin Bieber, Beyonce, Cypress Hill and The Cure.” Not convinced, I would explain about Colombia’s year-round temperate climate, the beaches, the ability for men to wear clear nail polish on their nails without fear of being ridiculed in public, the lack of tipping in restaurants, the affordable plastic surgery, and, how most of the money changers in the cities are now starting to run a cleaner business model. “A white guy like you will fit in just fine down there. You might want to spray paint your Nike shoes black before going down there,” is their follow-up response. Oh, well. Choice titles for my non-fiction Colombian dating book ranged all over the board. At the more desperate hours, I brainstormed titles that people might most easily recognize (The Lion, The Witch and Pablo). Then, while suffering from lack of financial security, I would choose more sinister titles like, The Sometimes Legal Things We Do For Money in South America, Colombia’s Creepy Book of The Month, The Art of Identity-Crafting In An Attempt To Impress Colombian Women and finally, A Lawsuit Waiting To Happen In Colombia. When in more jovial times, I would brainstorm more giddy, off-the-wall titles - How To Be Famous in Colombia Without Going to Prison, What Doesn’t Work in Other Countries Is Colombia’s Bread and Butter, Mobilizing Staggering Talent in the Andean Highlands of Colombia, Don’t Tell My Mom I’m An English Teacher In Colombia (She Thinks I Work In An Albanian Toothpaste Factory), Chocolate Binges And Mood Swings South of Tijuana, The Motorcycle Diaries of an Internet Romeo, and finally, Just Because I’m In Colombia…Doesn’t Mean I Can’t Dress Like a Puerto Rican. At my most flustered and anxious times I would literally pick out titles based on random sentences I read out of other books. These titles included, I’m Not an Idiot (I’m an Actor, Writer and Teacher in Colombia), Trying To Impress Colombians Who Are Richer And Smarter Than me, I Studied Psychology and This Isn’t a Hijacking Situation, Watching a White Boy Stumble Through Life Makes Most Colombians Grin, and The Difference Between Tourists and Travelers. *** Please view/share the book "48,000,000 Colombians Can't Be Wrong," by Brian Ward on Amazon.